Helping Hands for Freedom is a non-profit organization that is dedicated to supporting military children and families facing injury, loss and deployment. Helping Hands for Freedom (HHFF) aims to improve children's lives through compassion, honor, mentorship and leadership programs. 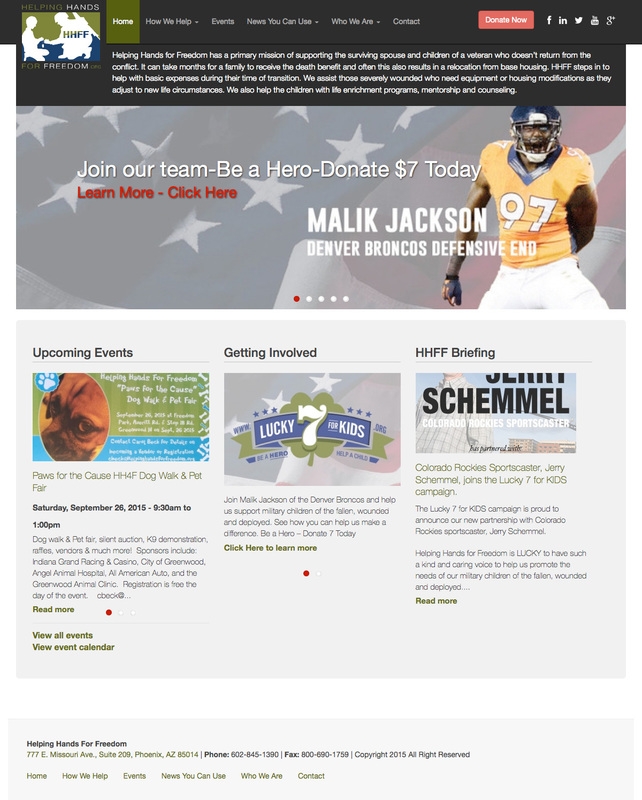 HHFF needed assistance in a website redesign, rebuild and e-commerce capabilites. We created them a fully responsive website using Drupal's CMS and integrated payment capabilites for event registration. Events are one of HHFF's main avenues to generate money to help military children and families. Providing an easy registration and payment capabilities on their website helps generate more attendees, efficient sign-in processes at the events along with great tracking tools for HHFF adminstrators. Rapid Web Creations continues to support HHFF through website maintenance, new functionality and content creation. We are proud to be a part of this amazing organization and highly recommend everyone review their website, learn more about their amazing cause and contribute in any way you can. You can view their website at the link below.